The badge earner has a proven expertise to build, run, deploy, and develop applications on a hybrid cloud development platform, using IBM Bluemix. The badge earner has demonstrated advanced proficiency on topics such as DevOps services, IBM Cloudant, Andoird development environment, Apple iOS, Push Notification Services, Node.js, Node packages, Liberty Profile, and MongoDB. Must be a student of the IBM Skills Academy with no prior professional experience. Completion of Module I - Cloud Computing Overview: Covering Cloud Overview, Trends, Case Studies. 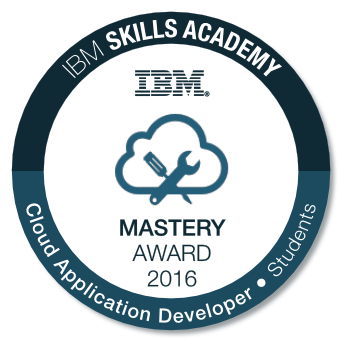 Passing the IBM Proctored Exam for "IBM Cloud Application Developer 2016".